Euro Falle #2 in many sides of glory! Aloha, loyal readers. Following on the heels of Otis’s recent guest post, Kevin has been gracious enough to permit yet another guest review. Mine, to be exact. I cannot thank him enough. Although I have lots to say about certain puzzles and puzzling in general, the level of effort and commitment involved in hosting a regular blog is staggering (Ed - Tell me about it - I have many Whack! Ouch! bruises to prove it) and I don’t intend to ever go down that road. This is a great alternative and I’ll try not to botch it. As a relative (and actual) nobody in the puzzling world, let me take just a minute for introductions. My name is Michael Desilets (Mike is fine) and I live and puzzle in Hawaii, or on whatever other Pacific island my work takes me. I am an archaeologist by trade, endeavoring to reconstruct human history from bits and pieces—the most complex and intractable puzzle ever. Quite likely an impossible object. I am not a particularly accomplished puzzler. I’m currently on a disentanglement kick (Ed - that might be partly my fault), but I do puzzle quite broadly. I must also say that I am not in any real sense a puzzle collector. I have very few items that would be considered rare or exceptional and am therefore closely akin to 99% of the folks who read this blog. That all said, I do treasure the small assemblage I have managed to acquire, I stroke and fondle them regularly, and I don’t intend to part ways with any of them. I may not be quite PuzzleMad yet, but I do spend an inordinate amount of time puzzling and thinking about puzzles. And now, apparently, I am going to talk about a few of them in public. But enough preamble. Let’s get to the puzzles. The Euro Falle coin release series began not too long ago with Euro Falle 02. Euro Falle 02 is a product of the Siebenstein-Spiele shop, one of the newest puzzles in their line. I don’t know who exactly designed it, Jürgen Reiche himself I suspect, but please help out here if you are in the know. I purchased mine from Puzzle Master, where it is still listed, but it can also be found at a number of other reputable online stores (MrPuzzle, Puzzle-shop.de, Brilliantpuzzles). The original stock at Puzzle Master appeared to sell out quite quickly and, having dallied, I was afraid I had once again missed out on an interesting small run puzzle. Not to worry though. Euro Falle 02 was soon relisted and by then had also been picked up by other retailers. I can only assume that it has taken its place in Siebenstein-Spiele’s regular line. It should be around for some time. But don’t be complacent, especially if you are a fan of this genus. I, for one, am a big fan of this genus. Coin release is an undeniably romantic concept for a mechanical puzzle, second only to locks in this regard. Ok, boxes too I suppose (forestalling a drunken protest from Boxes and Booze). Coin release puzzles often present very compact implementations of a mechanism (excluding those that incorporate mazes of course). There is very little place to hide within a simple coin release puzzle. MINE’s coin puzzles (e.g. Hole Vacancy, Hard-Boiled Coin) are great examples. These puzzles are barely bigger than the coin itself! The mechanics of the ‘trick’ in a coin release puzzle has to be exceedingly elegant, inventive, and efficient. The mechanism often has to hide in plain sight. Good designers can pull this off. I would count the Euro Falle 02 as a great example of the genus. It is in all respects the quintessential coin release puzzle. The Euro Falle 02 is a small, but quite robust little puzzle constructed of three layers of laser-cut wood. If you’ve never put these laser-cut wood puzzles up to you nose and sniffed, I highly recommend it. It’s quite intoxicating (Ed - I'm glad someone else likes it and admits to it! I thought it was just me) and oddly nostalgia inducing, at least for me. The wood layers are fixed at either extremity by nickel plated steel pins. Your tantalizing objet du désir, a Euro, is locked away behind a thick plastic bar in the center of the puzzle. Inlays of differently colored wood provide nice contrast and detail. As is often the case, you may not receiving precisely the puzzle as it appears on retail sites. Wood color varies, and inlays as well, especially between different manufacturing runs. This should come as no surprise to most puzzlers. My copy came as depicted, with the darker wood finish body and light colored inlays and back side. It’s a great looking puzzle. Construction and finish are top notch and it has an undeniable sturdiness to it. It is not fragile in any sense and you should have no hesitation passing it around. Be careful though. If your friends are like mine, they will find great humor in replacing your Euro with a folded up IOU note. As you can see from the picture, “Euro Falle” is etched (burned?) on the front along with the series number 02. Where is Euro Falle 01 you ask? I have no idea. But I already know that I want it. My usual slap-dash Google search turned up nothing and I am regrettably not in the know. I’ll defer to the higher levels of the puzzle community on this. I’m sure there is some interesting background to be had. If you know, or if your name happens to be Jürgen Reiche, please drop a comment below. Thanks! Ed - I'd like to know too. The front side is very nice, but there is also a reverse, upon which is written the shop name and “Bei uns ist ihr Geld sicher!” Indeed it is and we’ll get to that aspect shortly. Also on the reverse side, front and center, is a one cent euro coin. Very curious indeed. Is this part of the solution, a decorative flourish, a decoy? All of the above? I’ll never tell. But it is distinctive, that’s for certain. To continue one of the longest-running and mildly amusing (at least the first couple of times) observations in the industry, you can subtract the value of the coin from the price of purchase. In this case, however, you have two coins. 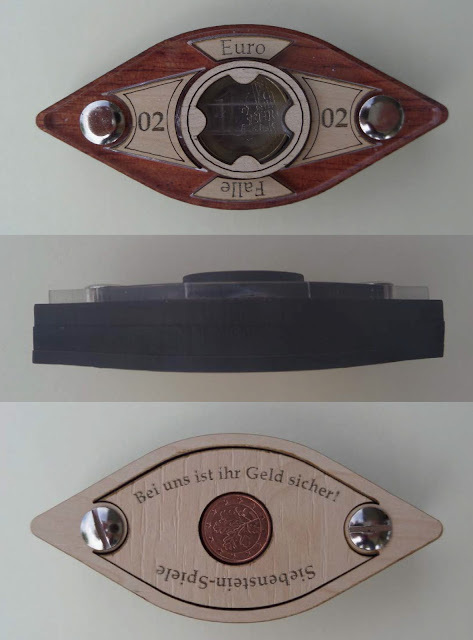 Siebenstein-Spiele has upped the ante for coin puzzle ‘value added’. I’m hoping Euro Falle 05 will contain a Krugerrand. Think that over Herr Reiche. Now the hard part. Discussing the puzzling aspect without emitting a whiff of spoiler. That is the real art of writing a puzzle review, as I have just now learned. The regular bloggers, you know the ones, are quite adept at it and I tip my hat to them. I myself am quite paranoid about spoiling a puzzle, especially one of this type, which would be easy to do. I’ve found that even novice and moderately experienced puzzlers are quite sharp, despite their protestations (Ed - not me! I'm definitely not terribly bright! ), and most can intuitively zoom in on a simple mechanism from very few clues. So I’ll keep this brief and experiential. I found solving this puzzle to be a fun and gratifying exercise. This is clearly not a 15 step box or a high level burr. Those are high quality carbohydrates whereas this puzzle is more like a teaspoon of sugar. That’s the nature of these little gems. You can’t expect a long play time and it would be unfair to hold it to a high standard in that regard. That said, this mechanism was a new twist for me and I carried it around and poked at it for probably a good hour, off and on. With concerted, undistracted puzzling it would probably be much shorter. It could be very short. It could also take forever. You just have to do the right thing, or things. I can tell you that there are two distinct steps, which for such a small puzzle is very nice indeed. My recommendation, following the good advice of others, is to take it easy and enjoy this puzzle over time. You will be puzzled longer and therefore probably have a more intense a-ha moment. This one is great for the pocket and would be great for friends, co-workers, family, etc. Few, if any, moving parts and it is nearly indestructible. Just carry it around for a while and think about. An unsolved puzzle is a source of great wonder and you should enjoy the mystery for a while. When you find yourself in a mental state amenable to an unmitigated a-ha, go for it. I don’t think you’ll be disappointed. Now for the crass part. You’re probably looking at 24 CAD/18 USD/16 EUR/12 GBP plus shipping for this puzzle. Everyone seems to be in the same ballpark on price, so go to your favorite retailer. As usual (at least if you are on an island) your biggest challenge will be to get reasonable shipping rates. Bundling with other puzzles helps with that, plus it’s a time-honored excuse to buy more puzzles. As far as value, I think the price is right, considering its quality and probable longevity. As I mentioned, it is robust. You will be able to hand this one down a generation or two. As with all puzzles of this type, you can’t expect much replay value. Overall, this is a high quality puzzle with a clever mechanism and it is being offered at a reasonable price. You should probably get the Euro Falle 02. If you are a collector, there is no question whatsoever. Ok, that’s all from me. I hope you found it worthwhile. Stay tuned for Euro Falle 03 and 04. Kevin, can I go now? Thank you Mike - a beautifully worded review and a pleasure to read - I barely did any editing apart from adding links and have to remind you that genera is a plural of genus. I look forward to more in the series. If anyone else feels the urge to write an article then please get in touch and I will certainly consider it. Mike, a very nicely written review. Well done! Thank you. After reading your guest post, I decide to take my Euro Falle 03 with me on my 5 day business trip. Night time play of course, not during the work day. Hopefully I can solve it before I get home. Thanks Jerry, i appreciate that. You Kevin and others have set a high standard for these reviews. Glad i can measure up. EF03 a little less 'pocketable'! Its a nice twist on the EF02. Will be a post on that and EF04 in the not too distant future. You'll have cracked it well before that, i think. Thanks Otis, I really enjoyed your review as well. What happened to your Euro Falle? That's shocking that it broke! It seems so very tough. I guess I may have to retract my 'nearly indestructible' comment. And also add that no real force is required for the solution. I should have mentioned that. Rookie mistake! Rookie blogger mistake, i should have said. And I'm sure Rox will forgive you. Thanks Box! I've been eyeing Pandora for a while but just haven't pulled the trigger. With your thumbs up, I guess its now time. And I get to pick my own coin? Fabulous. Any chance of absinthe-based pairings in the future?